Have You Looked at Your California Business Insurance Program Lately? A few weeks ago, we sat down with a potential new client to discuss his insurance program in detail. His policies were due for renewal in a short time. The client was a California General Contractor who, for the most part, was a custom home builder, but one of his new projects for the coming year was a twelve unit townhome building. Now, he had already started the project, and, in fact, on this project, he was going to have his own crew doing the framing. This contracting company already had an Orange County business insurance policy in place, so the owner just assumed there was coverage for this project as well. If it has been some time since your company has renewed your current insurance program, contact PJO today! As you can imagine, this was not even close to being the case. In reviewing his current CA general liability policy, not only was there an exclusion for multi-family housing, aka: townhomes, but the policy also excluded framing, as well. To say the least, the client was shocked. We, in turn, went to market and found the appropriate carrier and coverage for the client’s needs as well as increased his limits since this one project required a three million dollar insurance limit. Also, we learned that in the previous five years that he had this insurance policy, not once did he review his coverages and exclusions. Unfortunately, this happens way too often. One of the first things our insurance agency does when working with potential clients, whether they are currently insured or just starting their new company, is to spend as much time as necessary to learn as much as possible about what products or services their company will be involved in. Here, at PJO Insurance Brokerage, we feel the more questions we ask our clients, the better we can understand their type of operations and present them with an appropriate insurance program. For instance, say your company is involved in the construction industry, whether that would be as a General Contractor who sub-contracts everything out, and what we call a “paper” contractor, or one that self-performs many functions with employees. Or is your company an artisan sub-contractor in fields such as Electrical, Plumbing, HVAC, Concrete, Painting, Carpentry, Framing, and Roofing, to name just a few? As we have mentioned before, having a General Liability Policy does not cover everything, so we try to learn as much as possible about your company, so we can assist you in having an insurance program that will protect your company in case there is a claim filed against it. If your company is in the professional areas of a Consultant, Project Manager, Web Designer, Real Estate Sales, or one of the many diverse companies that make a living advising clients, having only a General Liability Insurance Policy is not going to give you the proper insurance coverage your company needs. Another step, in this instance, should be to acquire a Professional Liability Insurance Policy for your California business. Again, we will review everything about your company and what services you provide to assist you in obtaining Professional Liability Insurance Coverage that will protect your company. Does your company either manufacture, distribute, or rep some kind of product? Chances are your current policy may not have the appropriate liability coverage for products, especially if they are medical products, health products, or dietary products. Again, this is where having an experienced insurance broker can assist you with obtaining the proper insurance coverages to ensure that your company is properly insured. When you think of all the many different types of businesses that make up the Southern California landscape, there are almost as many types of insurance coverages available to these businesses owners to protect their companies. At PJO Insurance Brokerage, we feel that one of the best ways to develop an insurance plan for a company that will include the proper coverages is to thoroughly ask as many questions and learn as much as we can about the company’s operations. Also, we recommend to our clients that they establish a plan to periodically review their current operations to see if there have been or if they are planning any significant changes in their services, products, equipment schedules, etc., so we can make the necessary revisions to their insurance program. 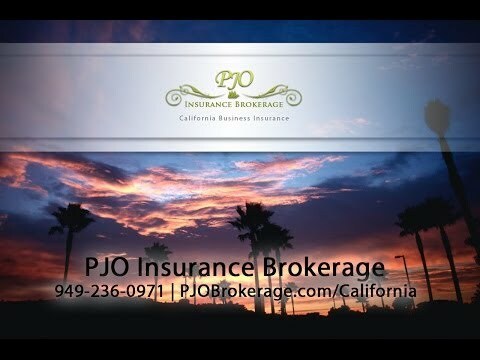 If it has been some time since your company has renewed your current insurance program, or if you are in the process of launching your new company, PJO Insurance Brokerage in California welcomes the opportunity to work with your company on your insurance needs.